This was the entry that I was hunting for when I discovered my missing month. 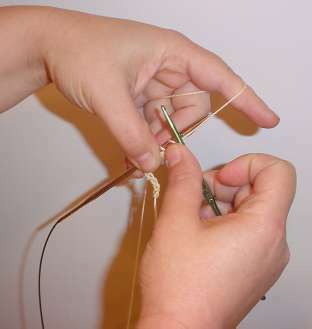 It describes crocheting onto a needle to start a provisional cast-on instead of just making a crocheted chain and picking up stitches along the back ridge of bumps. This was originally posted on 22 June 2004. Enough boring everyone with rehab junk. You came here to read about knitting, and not to visit This Old House. First I pick a nice smooth cotton string-type yarn, and a crochet needle a size or two larger than I’d use with it for a crochet project. In this case, I raided the Baby Georgia I was using for the filet knitting project, and grabbed a Bates F size crochet hook (more on hook sizing another day). Once the yarn is in the back of the needle, I’m ready to crochet on my next stitch. 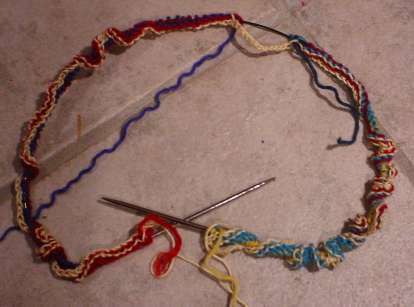 I usually crochet on several more stitches than I need, just to be sure I have enough, and end off with five or six plain chains as insurance. Once the stitches are on the needle, I can switch to my knitting yarn and begin my first row of knitting. 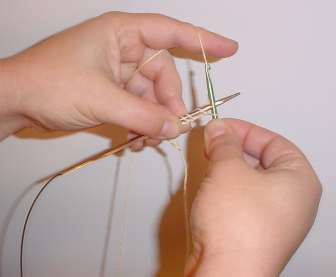 If I have more stitches cast on the needle than I need, I just slip off the excess. They become normal crochet chain stitches and sit quietly until the end of the project. No worries. When it’s time to awaken the provisional stitches and begin knitting in the other direction, I find the last chain stitch I did (tie a knot in the dangling end if you think you might not remember which is which), carefully unpick that last stitch, then pull the strand to zip out the crochet stitch by stitch. As each knit loop is freed, I slip it onto a waiting needle. Here’s my newly re-started raglan. Note that I’m knitting the back and the front at the same time. That way I am guaranteed that they match row for row and decrease placement for decrease placement. How did I manage to take the photos above? Not by growing extra arms, that’s for sure. So far all of the “hands working” shots on this blog have been taken by Alex, my 8th grade daughter. She may not knit, but she handles a mean digital camera.